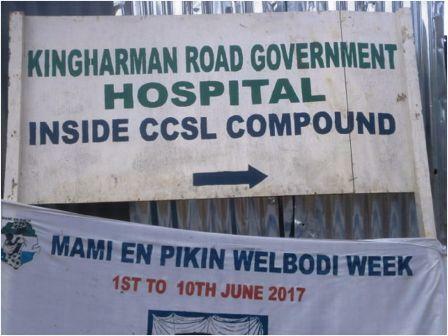 Sierra Express Media (SEM) has discovered that water shortage and a flip-flop electricity supply is seriously disturbing the normal operations of the Kingharman Road Hospital at Council of Churches Sierra Leone (CCSL) compound, Brookfield’s in Freetown. Facilities we all know that, for any health center to work effectively there should be continuous water supply and effective energy distribution which are lacking at the said clinic. Findings unearthed that, the unreliable power and water supply have resulted in Laboratory Technicians unable to carry out their duties accordingly because they cannot do anything in the laboratory without the two basic amenities highlighted above. SEM also discovered that as a result of the numerous inadequacies surrounding the newly relocated health center, the Minister of Health and Sanitation (MOHS), Dr. Abubakarr Fofanah and the Chief Medical Officer (CMO), Dr. Brima Kargbo earlier suggested to close the hospital until it is properly built but considering the fact that, closing the center will be disadvantageous to community people in that vicinity, they therefore allowed it to operate for the benefit of area people. When contacted, the Medical Superintendent, Kingharman Road Hospital, Dr. Amadu Sesay argued that the hospital is enjoying twenty four (24) hours light and water supply adding that the hospital is operating normally as required but he was challenged by patients and people who frequently visit the center that there are so many problems affecting the hospital. It is alleged that the Medical Superintendent is afraid of saying the truth in order to protect his job. In another development, patients were grumbling in the hospital that they find it very difficult to honor what they described as extra charges to seek medical services at the said clinic on daily basis especially among women. They alleged that they paid Le15,000 for registration and Le20,000 to see the doctor.